Our mission is to provide you with the lowest cost*, highest quality scanning service available on the Internet, to turn your precious photographs into convenient digital images. Just imagine having all your old family and vacation photos immediately available on your digital devices, instead of being locked away in some closet or storage space! *($0.30/image for slides and negatives). By the way - we also print photos and enlargements. That means that after you've had your slides or negatives digitized, or your old, faded photos upgraded with our Premier Service, you can get new, fresh, prints of those special photos that you want to have in hardcopy. For more information, go to ourPrintspage. We scan all types of slides (including Stereo Slides!) and negatives, and all size formats - we even scanDisc filmandfilmstrips. When we digitize filmstrips, we do it without cutting them into short strips. We can digitize photos up to approximately 12" x 18", and we scan Photo Albums. Also, check out our Loyalty Program for discounts we give to repeat customers (below). Are your Slides in Carousels or Trays? No problem! We don't charge extra for those - other Companies charge as much as $4.95/carousel extra for that! Send them to us in the carousels or trays - we'll send them back to you the same way. Or, even better - you might want to take advantage of ourSpace-SaverTM Option. 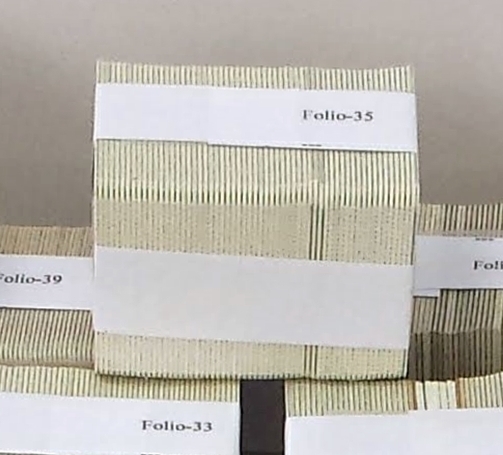 After we digitize the slides from your carousels or trays, we will bundle them together (in order), and label each bundle with a unique ID that ties it to the information that was on the carousel or tray box (contained in a separate spread sheet) for easy identification. Then we ship your slides back to you (in a much smaller box!) and recyle the old carousels or trays. Are your Slides in glass, or Other Special Mounts? No problem! We don't charge extra for those either! Other companies (if they will process those special mounts at all - most won't) will add a hefty extra charge for anything other than plastic or cardboard mounts. What's worse, if you have glass-mounted slides, they will try to remove the slide from the glass mount. If the photographic emulsion has stuck to the glass, that could result in damage to, or the destruction of, the slide image. We don't need to disturb the slide to convert it - our special process can handle the image capture with no changes to the slide whatsoever. Your slides will come back to you exactly as they were when we received them. Stereo Slides! We may be the only service that can digitize your Stereo Slides! Not only that, but in addition to scanning and digitizing them (both images in the pairs), we can print your stereo images in pairs so that you can view them in 3-D, even without a stereo viewer. Don't let yourself fall into the "procrastination trap", which is the idea that "I have to get all my photos sorted and organized before I can have them scanned." Our high-definition proprietary imaging system allows us to set our pricing at a low enough point that it becomes practical to just have everything scanned, and then do the sorting and organizing on your computer - which makes the job much easier. Digital images on your computer are much easier to see and work with than stacks of slides or negatives. To keep our operating costs low, and to keep our prices as affordable as possible, we do not operate from a traditional "store front". Our shipping address is a UPS Store, where we receive shipments of photographic material from all over North America and can have them kept in a secure location upon arrival. If you are "local" to the Glen Mills, PA area (within about an 80 mile radius) there are several other ways to get your photographic materials to us. Depending on the size of your order, and the distance involved, we can provide pick-up and delivery service - either free, or for asmall mileage charge. That link will take you to a chart where you can see what your charges, if any, will be. We can also meet with customers by appointment at the Wilmington Pike address (the UPS Store at 391 Wilmington Pike, Suite 3, Glen Mills PA 19342) to receive and then to deliver your materials. Our objective is to make it as convenient as possible for you to get your photographs preserved and/or restored. Whether you are in the local area, or elsewhere in the US or Canada (we receive materials from all of North America), when you have photographs, slides, or negatives that you wish to have digitized or restored, please fill out aScanning Request,so that we can provide you with instructions, and schedule your work to minimize turn-around time. Please call us: 484-502-6706 oremail uswith any questions. Once you have your precious photos saved into digital form, you may want to organize them or find specific images. To help you with that process, we distribute your photos into a series of Folios (subdirectories) that typically hold about 50-60 photos each (unless you have specified some other organizational system). This index image makes it much easier to organize and sort your pictures, or to find a specific image, since each thumbnail image has the file name just below it. 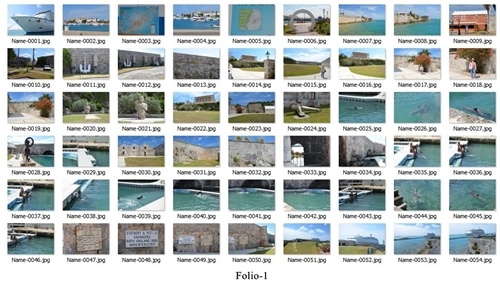 You can print these index images out on your home printer for easy reference. If you don't have a way to print them, you can include printed copies with your order, for $2.00/page (for the first ten pages) printed on plain 8-1/2" x 11" 20lb bond paper, which is what we recommend. If you want to have them printed on photo paper, the cost is $3.00/page for the first ten pages. The cost per page goes down for larger quantities, to as low as $1.40/page. For full pricing please see ourPricing page. In addition to providing your image files on a flash drive or DVD, for a small additional charge ($0.02/image - $0.04/image after 1/15/18, + disc cost) we can assemble your pictures into a HDTV Video Slide Show. We can then put that slide show on a DVD that you can play in your DVD player so you can enjoy your pictures on your TV set, as well as your computer. It is important to note that all our scanning services are CROP-FREE. Unlike some other (many other) services, we will not crop your 126 format and Super slides, your photos, or your negatives in the scanning process. The files you receive from us will contain the full images that are on the original material. What we offer: We will scan yourSlides, Negatives (including Disc Film) and Photographs, all formats. For slides (2" x 2" standard mounts: 35mm, and other film sizes) we scan 35mm slides at a resolution of 16MP. For other formats (for example 110, 120, 126 and 127 Super Slides) there may be slight variations in the total MP size of the image. High resolution scanning means that you will get all of the available detail in each slide converted into your digital image. Each scan will be processed to remove dust and scratches, properly oriented, color balanced and presented as a jpeg image file (RAW files are available as an option, at a small additional cost) stored on the medium of your choice. You can see samples of our slide conversions here. We also offer both photograph restoration and photograph retouchingservices (also called photo editing). If you have old or damaged photographs, there is an excellent chance that they can be restored to near-perfect condition. For more details, see our Photo Restoration page. If you have a photo that is not to your liking, with some sort of "defect", we can probably cure that situation as well. Need to remove the "extra ten pounds" the camera adds? Check with us. Got a great picture except that it includes your "ex"? We can "take them out". See our Photo Retouching page for more information. Our policy and practice is to receive materials from our Customers and have them completely processed and ready to ship back to them within two weeks or less of their arrival at our location - with an emphasis on the "or less" part! If our workload at a particular time does not make that possible, we will inform you when we respond to your Scanning Request. If you want to get your scanning work done quickly, then you will want to send it to us. If you have a large number of items to be scanned, you may want to consider our Monthly Submission Program. This will make it easy for you to spread out the cost of digitizing and preserving your memories, and to reserve a priority spot in our work queue each month instead of having to take a chance that a high volume of work might delay your submission. Here's how it works: Three weeks after your first order has been processed, we will automatically email a new shipping label and Order Form for your next batch of materials to be scanned. We will hold a priority spot in our work-flow for your order, and as long as your materials arrive within ten days, your work will be given priority status, and inserted into our work flow when it arrives. If your material does not arrive within ten days of the email, it will be placed at the end of the queue. There is, of course, no obligation involved, you may stop submitting material at any time. "I was very very happy with the outcome! The reproduction was excellent. Frank converted my old slides, some dating back to the mid 50's, and they came out great! Frank is very professional and easy to work with. I've used Costo and Walgreens in the past and Digital Conversion beats hand down these competitors in both quality and price. I wish I would have found him sooner." "Professionally done, promptly done, and superb communications throughout the process. Oh, and yes, very reasonably priced! Excellent value. I could not be happier." I am EXTREMELY pleased with Digital Conversion's work. Frank took over 800 very old slides and converted them to DVD. They beat ANY other company BY FAR in price and they do exceptional work! They even come to your home to pick up your work and deliver it when done. It's super customer service. I recommend them to EVERYONE." "I recommend Digital Conversions very highly! Frank converted 300 very special family photos and scanned them promptly and professionally. I could not be more satisfied and highly recommend his services to anyone converting media to digital formatting!" "Hi....this is Barry, Bob's brother. I thought you might want to hear from "the horses mouth" (never could really figure out that one!). FABULOUS. I can't believe you actually turned those 30 year old slides into real life. " "I am very impressed by both your business model and my interactions with Digital Conversions so far... As mentioned before, your business model and customer service have been amazing. I'll be in touch soon with our next project for you." "We are really impressed with the way you run your company and deal with customers. I don't think I've ever encountered such good communication and customer service!" "I appreciate what a good job you did to scan them so cleanly. I will recommend you to friends with no hesitation." "I have received your package last Monday and I did not have time open the box till today. I am really thrilled to see those pictures. You did a great job. Thanks a million"
"Digital Conversions helped me to restore a very old and damaged photo that meant a lot to our family. Fast service, quality work, professional!" "I can't get over the 'magic' you were able to do with my parents' wedding photos! I never thought that it would be possible to have a photo of them to commemorate their special day!... I can't tell you how much this means to me and I thank you from the bottom of my heart." We believe that repeat Customers are the most important ones we serve - and we feel that Loyalty deserves to be recognized and rewarded. Whether you decide to use our Monthly program or not, when your first order is completed, you will receive a Coupon with your order with a value equal to 10% of the total scanning charge for that order. (This discount program does not apply to commercial or government accounts.) That coupon can be used against the next order you send in, up to 20% of the scanning charge on that order (any remaining Coupon balance may be used on future orders as well). That 10% Coupon will be included with every order that we process for you! So, after your first order, you will always have a Coupon you can use to reduce the cost of your next order.